The sign, with its slender design and flower like, elegant appeal raises the iconic triple disc design above ground level, making it visible from the street. 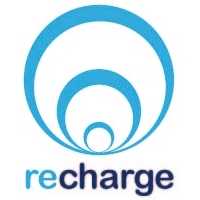 The slight resemblance with contemporary fuel station signs allows anyone to guess what ReCharge is for, thus simplifying the transition from petrol to electric driving. Is a charging spot available or how long do I have to wait until it becomes free? How long will it take until my car is charged? In addition a small green info-screen provides more information about electric driving in general and AwesomeMobility's vision.